Step inside the newly opened LAGO! On February 1, 2018, Chef Julian Serrano welcomed special guests to the exclusive opening of his first Shanghai restaurant, LAGO! 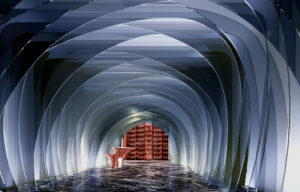 A continuation of our original concept for LAGO in Las Vegas, the second location was inspired by the Italian Futurismo movement of the early twentieth century and comes to life through custom avant- garde design. Compare the perfect precision of the interiors on the left to the studio created renderings on the right! The expressive corridor sculpted by arched glass fins tinted in a cool glowing blue. 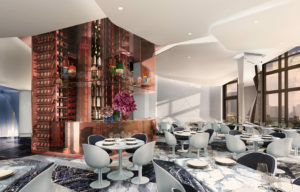 The main dining room features graphic white and sapphire coloured marble floors, a glass floor-to-ceiling wine display, and pristine overlapping ceiling panels. 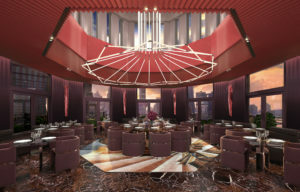 From a chrome portal, guests enter into a progressive copula informed by gradient shades of red and pink, while circular tables of layered coloured glass surround a grand custom light fixture.